From your local radio station… CFMB from 10 am. to 2 pm. For information or to donate please contact the HLBS @ 514-344-1666 or email at hellenicladies@bellnet.ca. Your support will fund the HLBS Welfare Program which has helped and continues to help low income families with groceries, rent, clothing, furniture, utilities, medical expenses, as well as compassionate aid during Christmas & Easter. Since 1922 the Hellenic Ladies Benevolent Society (HLBS) offers its “philanthropic services” to low-income families of our community, bringing them financial assistance and a ray of hope. 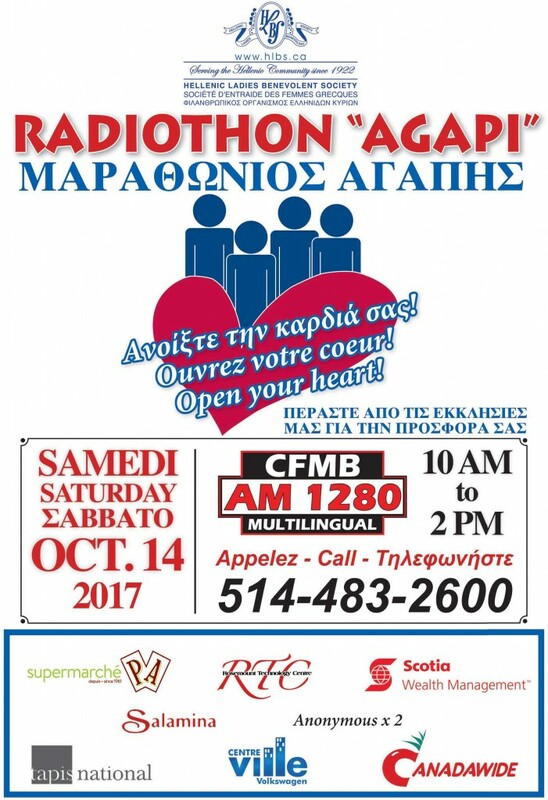 For 48 years you have shown your philanthropia through your donations to the HLBS Radiothon “Marathon Agapi”, in support of the HLBS Welfare Program. Our annual radiothon is important for everyone in our community, so by working together we can make a difference. HLBS 2017 Family Christmas Luncheon "Fundraiser for Scholastic Needs"